This Sunday, on November 6, 2016, there will be a joint talk event between the Okinawa municipal museum (沖縄市立郷土博物館) and OIST, held at the Okinawa municipal museum. The first talk is going to be presented by the curator of the museum, and it is titled “Why is Okinawa city the entrance to Yanbaru”? 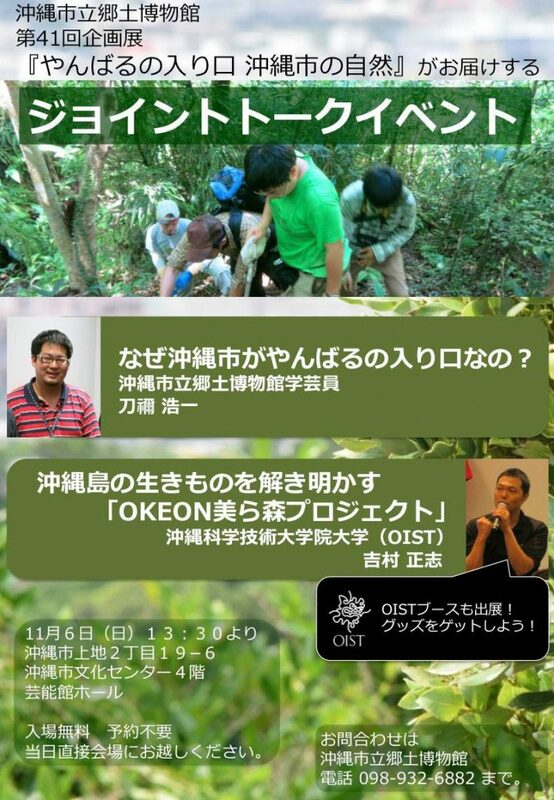 The second talk is given by Yoshi, the coordinator of the OKEON Churamori project, and his talk is titled “Figuring out the biodiversity of Okinawa – OKEON Churamori project”.OIST will also have a booth set up at the event. The talk will start at 1:30 pm and will be held at the 4th floor of the Okinawa Cultural Center, in the entertainment hall. If you have any questions please contact the Okinawa municipal museum at 098-932-6882.